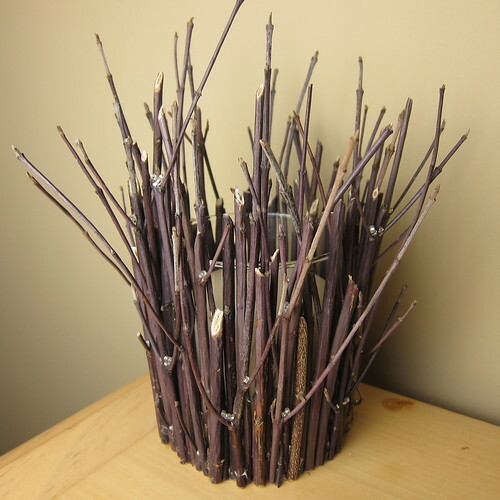 I covered a 3-inch glass pillar candleholder with willow branches & then “iced” the branches with slivery beads. 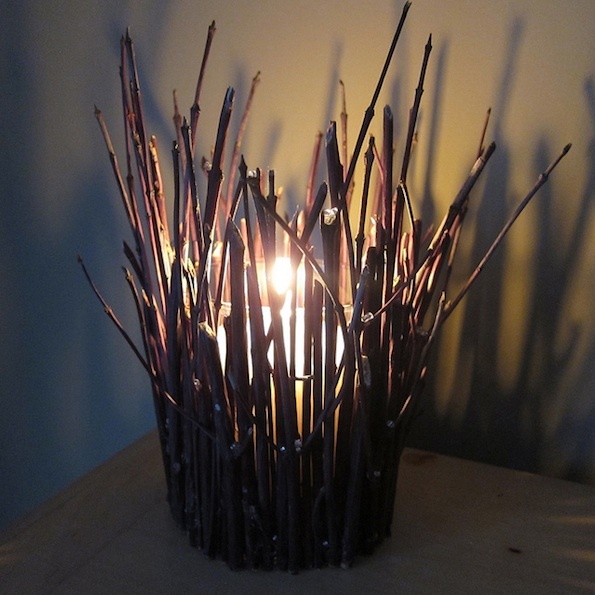 When lit, the branches make fantastic shadows on the walls & the beads shimmer with the candlelight. It reminds me of bare winter trees covered with ice. do any size you want. A group of votives would be pretty too. Thin branches – Mine were 1/4″ at their thickest. 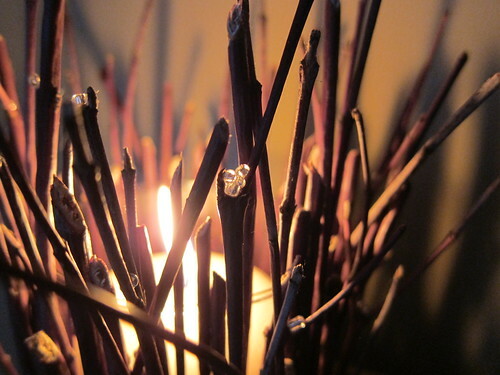 Cut your branches so they are the same height or taller than your candle holder. I found a diagonal cut looked nicest. 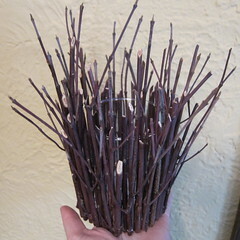 The thicker ones are best kept close to the height of the holder while the thinner ones can vary in length. Make sure to leave some with small side branches. 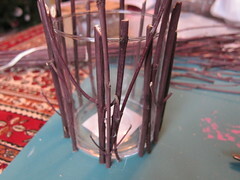 Using the glue gun, start gluing the branches around the candleholder. 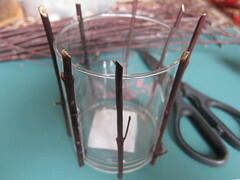 Begin with the thicker shorter branches without any side branches. Keep filling in as you go around. 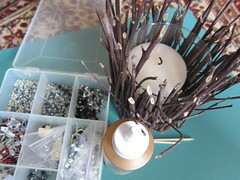 Glue the ones with the side branches on last. 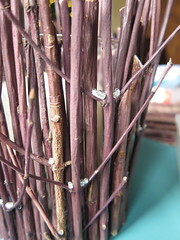 You want to make sure no branches hang over the inside of the candleholder where they might catch on fire. Let the glue dry. 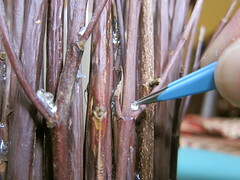 Use your tweezers to dip beads in a little craft glue & place them in the y’s of the branches or anywhere else you’d like a little shimmer. You can do a few beads or really cover the whole thing with sparkle. Let dry. Never leave unattended with when lit. Make this even more sparkly by adding some white, sliver or clear glitter to the branches like fallen snow. 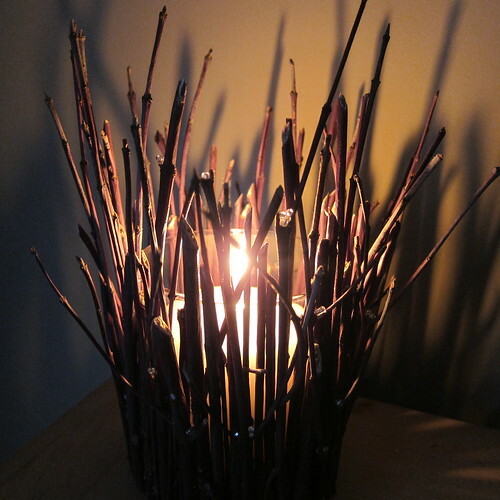 I think this candleholder would look really elegant with all the branches spray painted white too. Make sure to check out all the other great Iron Craft Challenge 1 Projects. Love this. The "ice" is a great added touch and the shadows are really neat. I did the Iron Craft challenge and just posted it. I love this light- how cool. I like the little ice crystals. It would make a nice tables setting. Hey you renamed and restyled too. I like it Kat.